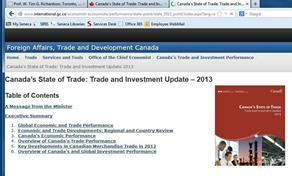 "State of Trade and Investment"
2013 " Since 2010, global growth has been on a downward trend, which continued in 2012. The damage done by the crisis (2008-2009) has not been fully repaired"
YouTube video made Jan 10th 2011 with Prof. Richardson's brief comments summarizing some of the points. 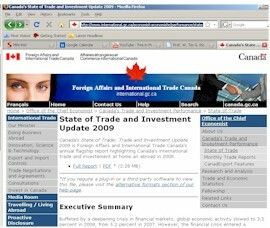 2008 Although written in the context of a "political environment", the webpage lists facts about Canada's trade and investment picture - which is important for students of international business to know. However, as the whole planet knows, the last few months of 2008 have shaken the world economy in a serious way - which means that when you are reading this document, it is, in a sense "historical" and not necessarily an indication of how things will continued in 2009. "Canada's trade with the United States is equivalent to 53% of our GDP. The United States represents roughly 4/5 of Canada's exports and over 1/2 of our imports. 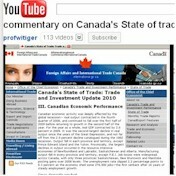 Canada, in return, represents 22.2% of America's exports and 16.5% of its imports. To date, Canada is the number one foreign market for goods exports for 36 of the 50 states, and ranked in the top three for another 4 states. In fact, Canada is a larger market for U.S. goods than all 27 countries of the European Union combined, which has more than 15 times the population of Canada. Canada and the U.S. have also one of the world's largest investment relationships. 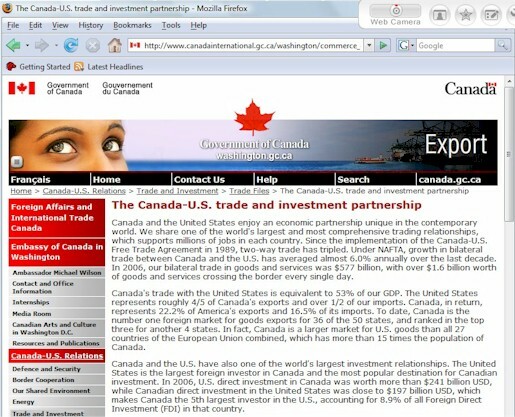 The United States is the largest foreign investor in Canada and the most popular destination for Canadian investment. 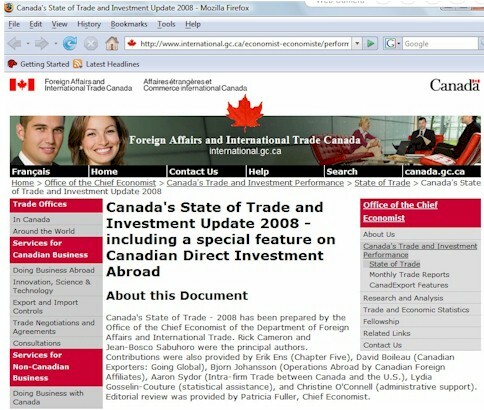 In 2006, U.S. direct investment in Canada was worth more than $241 billion USD, while Canadian direct investment in the United States was close to $197 billion USD, which makes Canada the 5th largest investor in the U.S., accounting for 8.9% of all Foreign Direct Investment (FDI) in that country."